A catalogue of building extensions carried out by Mark Titman; including Kitchen Extension, Home Extensions and Basement Extensions. If you were looking for Loft Extensions you can find them here. Titman Design is based between Dorset and Greenwich, London although work will be considered for locations further afield. Please feel free to contact Mark if you have any questions or would like to enquire about undertaking a new project. Kitchen Extension - 78 Heathwood gardens. 78 Heathwood Gardens is a Victorian terraced house. The proposal is for a side extension situated at the rear of the house. The existing house is situated just outside of the East Molesey conservation area. It is a Victorian three storey detached house, built of brick with roughcast render, it has timber sash windows and an unattractive monopitched extension at the rear that is cramped and used as both storage, w.c., utility room and kitchen. It’s neighbouring house at number 11 has a long extension that extends 5.5m back into the garden. The proposal is to demolish the existing kitchen, utility and wc extension and build a new one over the existing footprint and to extend the bathroom at the front on the first floor over the existing porch as the neighbours have done. The proposal for 63 Nithdale Road was to build an extension on the rear and rear side of a terraced three bedroom house and to convert the outrigger loft into a bedroom and the main loft into a playroom. The proposal is for a single storey glazed extension at the rear of a three storey Georgian house situated in the Conservation area of West Greenwich. The owners wish to extend their kitchen on the ground floor because they are a growing family and work from home. They require extra space in their kitchen for baby, work and household activities: that the extension will allow for. This family house has 3 bedrooms and the only original feature, which has been retained is the timber panelled walls on the second floor. The proposal is to build a kitchen extension on the rear and side of a Victorian semi-detached house and open up the kitchen area for easier access to the garden and within the kitchen; and to create better light as the owners work from home. 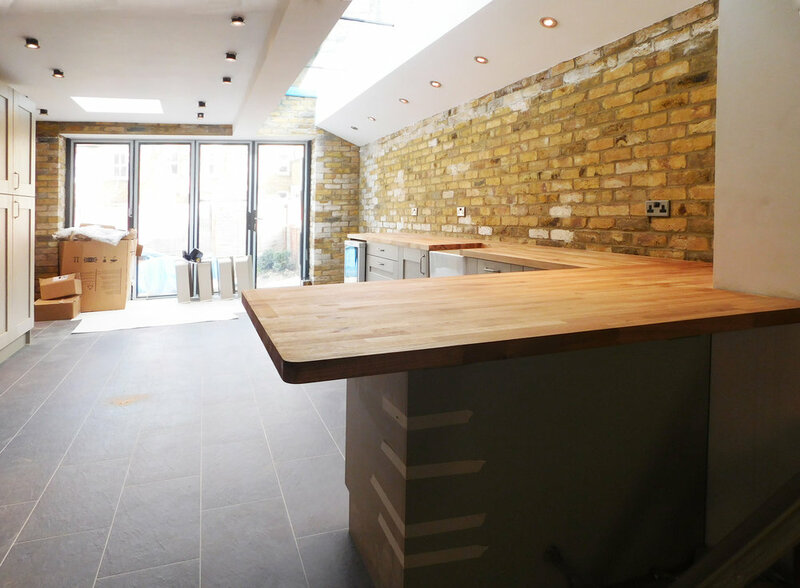 Kitchen Extension - 29 Swallowfield Road, London. The proposal is for a side extension situated at the rear of the house. The proposal is to build an extra bedroom and bathroom extension on the front of a bungalow situated on a steep hill with terraces. Basement Conversion & Extension - 32 Maze Hill, Greenwich. Two individual jobs were undertaken at this address, the construction of a kitchen extension and also the addition of a 'garden retreat'. The proposal is to build a rear extension on a terraced Victorian house. The proposal is for a two-storey extension to a terraced Georgian house in a locally designated Conservation Area, adjacent to the Old Dover Road and its connection with Kent. The clients of this Victorian terraced house wish to extend their kitchen to be able to live and eat together more frequently as a family and have clear access to the rear garden. This existing three bedroom house is a single storey 1970’s architect designed house that is set back from the street and is accessed via a corrugated plastic covered alley that leads past a thin block of two uninhabitable storage rooms. The proposal is for a new extension to the back of a semi-detached Georgian, three storey locally-listed house in a prominent Conservation Area at the Standard, in Blackheath. The proposal is to build a rear extension on a semi-detached Victorian house, with a small alley (only on ground floor) separating the house from next door. The brief was to refurbish the whole basement area to create a children’s play space, guest shower room, utility room, study area and kitchen/dining area. The proposal is to build an extension for a lower ground floor flat in a large four storey Victorian house and dig out a terrace in the raised back garden. The proposal is to extend this house at the rear and side. The house has an L-shaped layout and the proposal is to create an extension at the side that creates a gable end on what is presently a sloped roof over the garage. The proposal is for a single storey rear extension on an old school house that is now a residence for a growing family. The proposal is to build a ground floor kitchen extension and extend basement bedroom into existing light well on the rear of this modern (circa 2014) detached house. The proposal is for a side extension situated at alongside the existing ourigger and a 2m extension to the rear of the existing outrigger. The proposal is to build a yoga studio and office/artist’s studio in the back garden of a large, five storey, Victorian terraced house. The applicant presently has restricted access to the garden and limited space for dining with family and/or friends in the existing tight basement. An extension is therefore required in the basement of this Georgian four storey terraced house, that is located in a Conservation Area. Kitchen and Music Room Extension - 34 Crescent Road, SE12. The proposal is to build a two storey extension and new bathroom above on the rear of this four storey grand Victorian terraced house, by digging down to create a open plan basement kitchen and utility room/wc/storage room and playroom below.